Been wanting to order one of these for the longest time for all household chores. It's a life saver in so many ways. This Steam Cleaner is Equipped with a powerful 1050-Watt heating system and offers a chemical-free way to deep clean and Sanitize you whole Home. 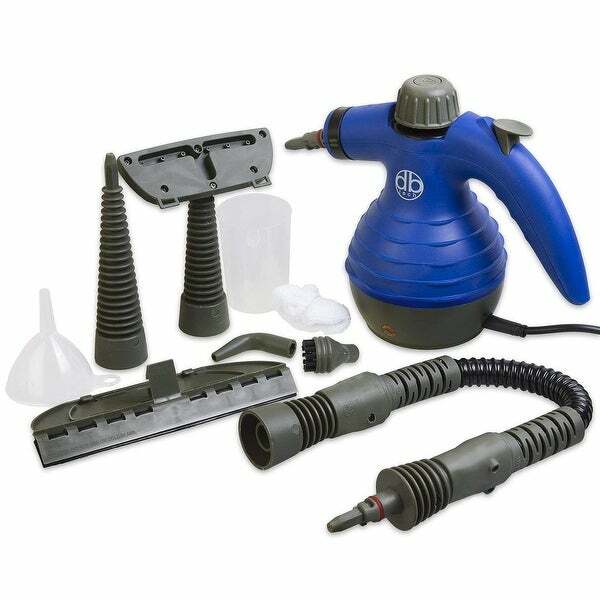 This Steam Cleaner has the perfect attachments to sanitize every inch of your home and to make it free from Bed Bugs, Lice, Nits, Scabies Mites, Skin Parasites, Pet Mange and Ear Mites. It is also great for Garment Steaming, or for cleaning cars, trucks, motorcycles and Boats, Cut through any mess using powerful high-pressure steam. The Steamer works on almost any hard surface, including windows, sinks, stoves, counter tops, refrigerators, and shower doors. It's also a fabric steamer to remove clothing wrinkles. Features 3 Minute warm-up time holds 6 ounces of water 210 Degree Tip Temperature 9 Foot Power Cord For Easy Mobility Effective on Mites, Scabies, Bed Bugs, Lice Mange and other insect infestations. Excellent for cleaning cars, trucks, motorcycles, boats, garden equipment, workshops, etc. Remove stains from bedding, carpets, blankets, headboard sand upholstery. Quickly and easily clean furniture, table tops and counters Clean tile, grout and shower doors with steam instead of harmful chemicals Easily reaches cracks and crevices other cleaning methods cannot reach. Remove chewing gum and candle wax easily and quickly. Clean blinds, drapes and curtains Accessories Squeegee attachment, Funnel, Towel sleeve, Measuring cup, Bent spray nozzle, Round brush nozzle, Flexible extension hose, Long spray nozzle and a Door/window nozzle PLEASE follow the instructions carefully and make sure to follow all the warnings! - Do NOT open the lid until all steam has been Released from the Steamer - Do NOT overfill the Steamer - Do NOT Point the steam nozzle within 6 feet of a Person or a Pet. Emits pressurized powerful hot steam continuously for up to 15-20 minutes; cleans and sanitizes a variety of surfaces, including, carpets, counters, floors, fabrics and vehicles. Steam Cleaner handheld is pressurized steam cleaner is tough on germs easy to handheld.